Neanderthal is classed as a full species, Homo neanderthalensis, named after the Neander valley in Germany where they were first described (as opposed to our own species, Homo sapiens). In the late Middle Pleistocene, haematite (iron oxide) was carried at least twenty km by Neanderthals. Whether used as red ochre for cave painting and burials as their descendants did 40 kya (thousand years ago), or for other ceremonial or even everyday use, Wil Roebroeks of Leiden University et al tried to discover. Their full research paper, 'Use of red ochre by early Neanderthals' was published in last month in the Proceedings of the National Academy of Sciences of the United States of America (PNAS) journal. They know of food preservation, insect repellent and tanning of animal hide as possibilities from our own species' ethnographic records. Manganese dioxide is another common pigment, found in very large quantities in France, while Spain, Czech Republic and France were supposed to have haematite in Neanderthal sites before some researchers challenged the ID and dating. Little connection can then be made with any pigment use apart from haematite in the Netherlands. From 250 thousand years ago, some red mineral has been recorded near Maastricht in the Netherlands, near some flint and bone scatters in an earlier Pleistocene river deposit of loess and gravel. The site has been excavated since 1981, producing bright red "concentrates" in the pale coloured sediment. Binocular microscope examination clarified that no haematite crystals remained in the red ochre, indicating they had been ground or otherwise made smaller. Hominin(either Neanderthal or modern human) activity is theorised to have caused the iron oxide to enter the sediment from a liquid, from which blobs have become embedded. Even a reproduction of the presumed spillage caused the same effect of red ochre embedding in the sediment, viewed macroscopically and microscopically. Conclusions are based on very few tools found at the sites (one only, found unused). Fires were used there, but evidence of grinding sandstones is limited to a different era at Rheindahlen in Germany. African Middle Stone Age sites yield plenty of red ochre from rock shelters, which is contemporary with these Maastricht finds. Modern humans produced the deposits however. This leaves no need to propose symbolism in this mineral use. All other uses are possible. Significance really lies in such an early use (250-200 kha) of small amounts of red ochre, possibly for the same uses as nearby modern humans. 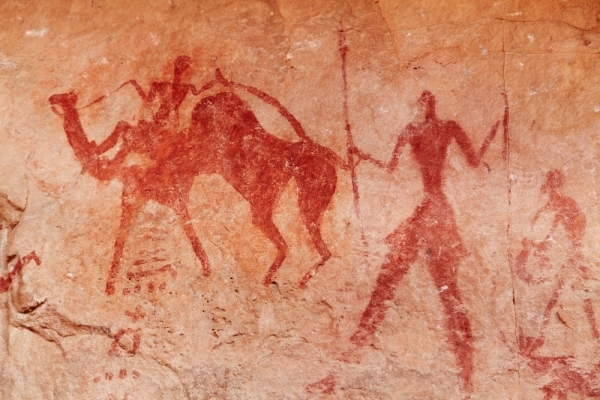 The excitement rises as more cave paintings, evidence of body decoration, tool use by both groups and even "cross-pollination" appears between the two species - or is it really subspecies!